Two Great Cycling Classics Remastered on DVD! The keen eye of Jørgen Leth brings an extraordinary look at the 1973 Giro d’Italia as Eddie Merckx drops the most talented cyclists in the world on this way to victory. 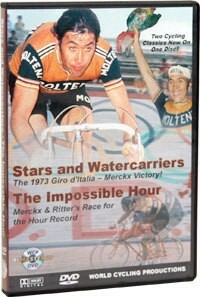 Considered one of the best films ever made on professional cycling. Approx. 90 min. The Impossible Hour follows Danish star Ole Ritter as he tries to regain his record for the hour ride which he had set in 1968, only to have it shattered by Merckx in 1972. A film about the quest for the heroic. Approx. 138 mins. (two programs).